Shotgun aficianados (eccentrics) such as myself are often interested in sparkling fountains of trivial (worthless) information. Some of this interest has been spawned by some of the more inventive (lie-filled) advertising campaigns from intoxicated marketing departments. 1) Back-bored (over-bored) barrels produce less velocity. 2) Longer barrels (over 24 in. ), with modern wads, produce less velocity. 3) Higher constriction chokes produce higher velocities. It is a bit of a silly conversation, for current SAAMI standard for a 12 gauge shotshell are +/- 90 fps. If a shotshell falls within a 180 fps envelope, it is within SAAMI standards. 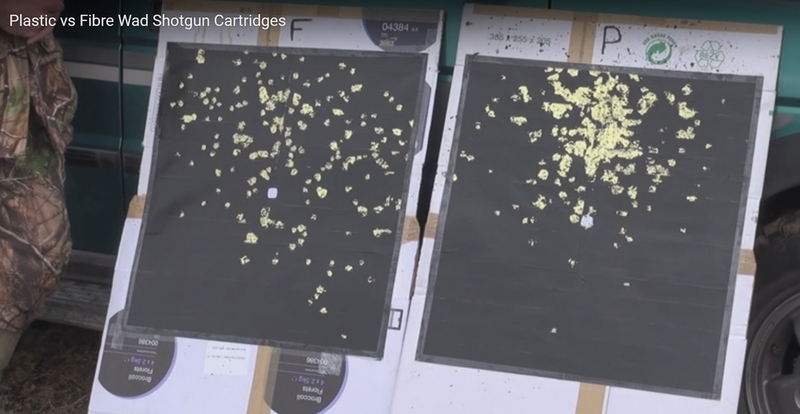 Certainly, most commercial shotshells are far more consistent than that, but in every box of cheap or promo-type loads, you can expect a shotshell or two that is off by 40 – 50 fps or so from the rest of the box. Barrels with larger bores reduce velocity. Anytime you generate gas into a larger confined space, pressure drops, and naturally pressure is what makes stuff come out of the barrel in the first place. Some of the nuttier advertisements claim “higher velocities and lower recoil” with back-bored (actually overbored or larger than standard bore) barrels, but that is of course not possible without inventing a new branch of physics. No human can actually feel a 30 or 40 fps difference on their shoulder, of course, but less recoil sounds good, regardless. If we could, we wouldn't need chronometers to find the odd shells in promo loads, we would just instantly feel them. Yet, muzzle velocity alone hardly determines strike velocity or penetration. If you are looking for performance, shot diameter is far, far more important than any other factor. Muzzle velocity, actually "3 ft. instrumental velocity," only matters perfectly if your target is three feet away. Fiber wad (left) vs. plastic wad @ 20 yards, Improved Modified choke. Oberfell & Thompson had no way of comparing the two. No one seems to know where the current “30 inch standard test barrel” came from, or why we still cling to that. The Mysteries of Shotgun Patterns by George Oberfell and Charles Thompson was written in 1957. The reason a goodly portion of that information is meaningless today is that Oberfell & Thompson were using vegetable fiber or cork wads. 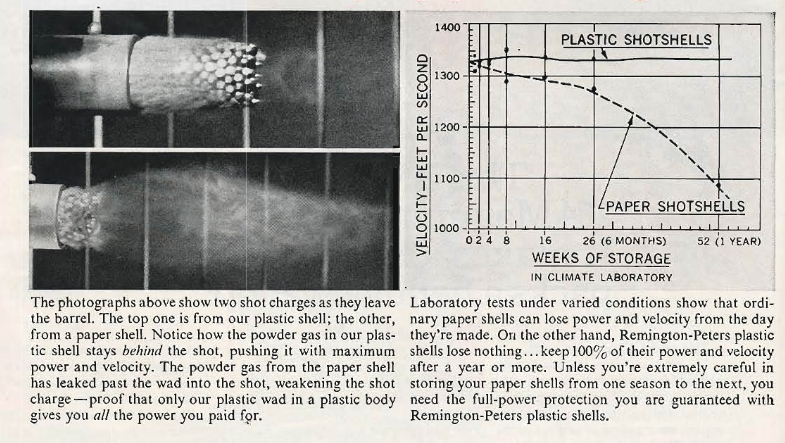 Plastic wads didn't become widely available until the early 1960s. The most recent tests, surprisingly, show that muzzle velocity is highest with 22 – 24 inch shotgun barrels. After that, muzzle velocity begins to decrease. The reason is wad drag, not present with the old, leaky fiber wads.